Tablecoth There are 37 products. 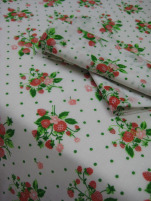 Strawberries tablecloth 65% polyester and 35% cotton, white terylene, finishing with a 2 cm hem all around. 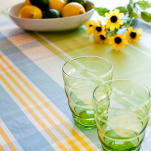 Tablecloth white background with green dots, dotted with clumps of wild strawberries: green, red and pink. 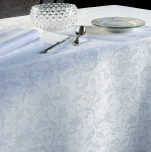 Tablecloth 100% polyester damask jacquard geometric shapes. Washable at 60°C, light spin, superfluous ironing or if necessary 110°C max.